finally got speedy new cable internet installed at the new house...sooo busy this past week with moving! absolutely zero crafting going on, but i am working now on organizing my new studio...happy, happy, happy. new creative mojo will be bloomin' soon!! just playing some more with my ArtRage program....meet my first digitally-painted dolly. i might just have to write a little children's book about her! since all my supplies are temporarily packed for a move, it's just me and my computer for a little while....oh and my bamboo pad and stylus too! 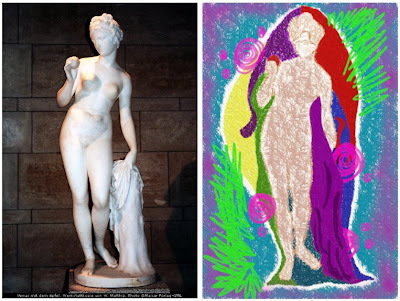 here's a rendering of an aphrodite statue that i made using artrage, a great little program! this is my favorite way to use up scraps. punch your scraps into little squares and tile them together randomly. 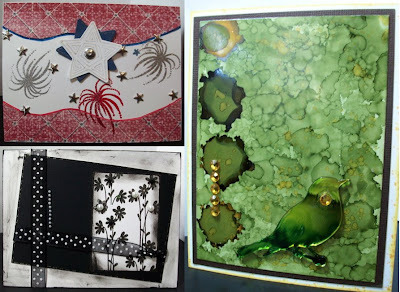 accent with a little bling and these make lovely collaged greeting cards! my paper scrap drawer is overstuffed and will barely close, and i am overstocked on my supply of "that paper isn't quite as cute as i thought it was." since i cannot bear to toss out perfectly good paper for cardmaking, my own personal challenge will be to whittle things down by figuring out creative ways to piece scraps together on to not-quite-as-cute cardstock. these two cute little cards used up 5 scraps each...10 down, and about 3000 to go....sigh. my hub's great-niece is graduating from high school this week! here is the card i made for her...her high school colors are blue and gold. we wanted to incorporate some of her childhood pics, so i did a collage. i hope she likes it...i thought the double-meaning of samuel johnson's quote "the future is bought with the present" was funny...no doubt she'll get some cash gifts from the family! congrats to the grads in your circle of family and friends too...lots of scrapbooking noises will be heard 'round the country this summer. hmmm, it took me only 30 years to do a layout for my high school graduation....lol! yesterday was the 5th, so i have drawn two names from all you lovely blog followers out there...one from the google peeps, and one from the facebook peeps. congrats—one of my handmade greeting cards is coming your way!! 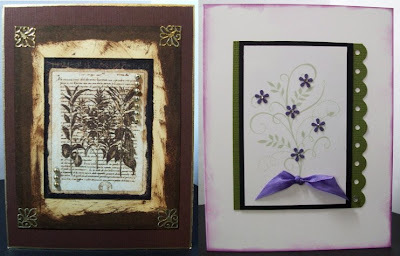 here are the cards i made today at an all-day cardmaking event at mainely stamping. i went with my good friend glenna. they had little stations all throughout the store, each with a designed card sample and pre-cut card pieces to assemble. of course, me being me, i didn't follow any of the rules...i mixed it up and distressed and inked and blinged things just the way i like! 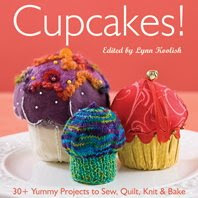 yay - we have 3 winners of the new book, cupcakes! thanks soooo much to everyone who entered—i hope you'll pick up your own copy of this book soon, you'll love it! for follow friday this week, i'd like to feature a couple c&t authors whose art i really like. 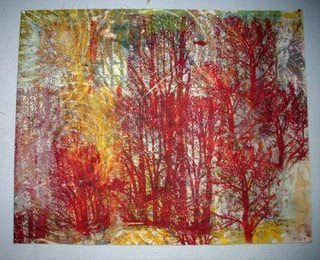 • rayna gillman does amazing things with paint on fabric. check out her blog to see her work—she has a great sense of humor too! 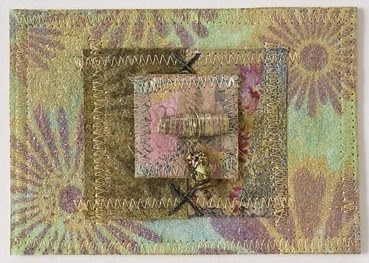 • rebekah meier does fabric art collage—she layers fabrics and embellishments together in the most beautiful ways! check our her blog here. hope y'all are having a swell weekend—thanks again for visiting my blog! i love do-overs...sometimes they turn out the best! this began as an aphrodite card, but the stamp smudged, so i painted over it with light blue acrylic. then i added a thicker peakier layer of iridescent white acrylic. while it was still wet, i dropped dark blue india ink on the lower half for the ocean, letting it travel and puddle, leaving some whitecaps. i love how the ink cracked on top of the textured white so it looks kinda watery. i dipped a plastic bottle cap into yellow india ink and stamped it for a nice circle of sun and swirled in some red. i finger painted more yellow, red and bronze inks to add mountains and a distant shoreline. added broken glass and glass beads, like a rock in the foreground. i quite like how this turned out...such a happy ending! i'm so excited! the cupcake books are finally here, they just arrived in the c&t warehouse!! 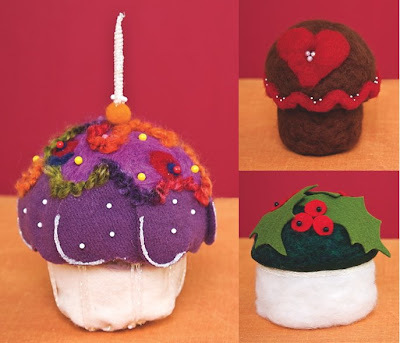 these are the three needlefelted projects i created for the book...a birthday cupcake, valentines cupcake, and a holiday cupcake. use one as a pin cushion or just display them on a plate for fun. they were so enjoyable to make, and i promise it's not hard to learn how—you really should try it! there are so many cute projects in this book, not just needlefelting either. there are projects to knit, quilt, sew and papercraft too. all the projects were created by c&t staff and authors. and it's just 6" square, it makes such a sweet gift for any crafter! for a second entry: talk about my book giveaway on your own blog with a link back here...or post a link on your facebook page, or tweet about it. then post a second comment here to tell me you did it. for a third entry: subscribe to my email list...enter your email address up there on the right. if you're already a subscriber, you're automatically entered once in the drawing! i promise not to bombard your in-box with junk, just some creative inspiration a few times a week. i will pick three winners at random from all the entries on thursday night, june 4th. good luck! !